Four teams will qualify automatically for next season's Champions League group stage. Liverpool and Manchester City have made sure of their places. Clubs outside the top four can qualify if they win the Champions League or Europa League. However, no country may have more than five teams in the Champions League - so if English teams win both competitions but both finish outside the top four, the fourth-placed team will enter the Europa League instead. The fifth-placed Premier League side qualify for the Europa League group stage, as do the FA Cup winners. 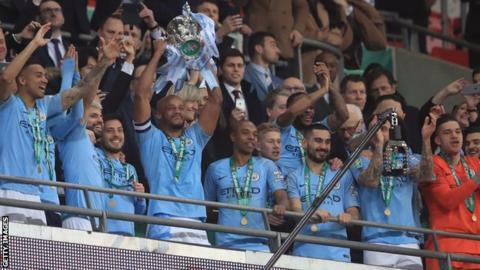 Because Carabao Cup winners Manchester City have already qualified for the Champions League, the sixth-placed team will also make the Europa League, entering at the second qualifying round. If Watford win the FA Cup, they will qualify for the Europa League. But if Manchester City win the FA Cup, that European place reverts to the league and the seventh-placed team will enter the Europa League. Teams are no longer eligible to enter Europe by virtue of being losing FA Cup finalists. At this stage, Tottenham, Arsenal, Chelsea and Manchester United are certain of at least a Europa League spot. The bottom three teams will be relegated to the Championship. Huddersfield Town confirmed their relegation on 30 March after a 2-0 defeat at Crystal Palace and they were joined by Fulham three days later after the Cottagers lost 4-1 at Watford. The top two teams will be promoted to the Premier League, with the next four entering the play-offs. Norwich, Leeds and Sheffield United have made sure of at least a play-off place, with West Brom close to joining them. Norwich can clinch promotion on Friday if they win and Sheffield United lose. The bottom three teams will be relegated to League One. Ipswich Town became the first EFL side to be relegated when they drew 1-1 with Birmingham on 13 April. Bolton will join them on Friday if they lose, or if other results go against them. The top two teams will be promoted to the Championship, with the next four entering the play-offs. Luton, Sunderland, Barnsley, Portsmouth and Charlton are all assured of at least a play-off place.. The bottom four teams will be relegated to League Two. Bradford will be relegated on Friday if they fail to win and at least two other results go against them. The top three teams will be promoted to League One, with the next four entering the play-offs. Lincoln City became the first EFL team to be promoted when they drew 1-1 with Cheltenham on 13 April, and can clinch the title on Friday if they win or if several of their rivals slip up. Bury, Mansfield, Milton Keynes Dons and Tranmere are close to making sure of at least a play-off place. The bottom two teams will be relegated to the National League. This looks likely to be two from Notts County, Yeovil and Macclesfield. The National League champions will be promoted to League Two, with the next six teams entering the play-offs. Leyton Orient, Salford City, Solihull Moors and Wrexham are assured of at least a play-off place, with AFC Fylde close to joining them - while Harrogate Town and Eastleigh could clinch the final play-off spots on Friday. The fourth and seventh-placed teams will meet in the first round of the play-offs, as will the fifth and sixth-placed teams. They are joined in the semi-finals by the second and third-placed sides. The winners of the final will be promoted to the EFL. The bottom four teams will be relegated and replaced by the champions and play-off winners of the National League North and South divisions. Braintree Town were the first team to be relegated on 30 March, despite beating Gateshead 2-0, and Maidstone United joined them on 6 April after losing 2-0 to Salford City, while Aldershot Town were relegated a week later after drawing 1-1 with Hartlepool, the same day that Havant & Waterlooville went down after losing 3-2 at Solihull Moors. Torquay United clinched the National League South title on 13 April. The Premiership has split in half after the 33rd round of games, with the top six and the bottom six playing the other teams in their section for a fourth and final time. If Rangers fail to beat Hearts on Saturday, Celtic can clinch the title by beating Hibernian on Sunday. The champions will enter the Champions League at the first qualifying round. The second and third-placed sides, as well as the Scottish Cup winners, will qualify for the Europa League first qualifying round. If the cup winners have already qualified for Europe through their league place, that Europa League spot will pass to the fourth-placed team. The bottom side will be relegated to the Scottish Championship, while the 11th-placed team will face the winners of the Championship play-offs over two legs, with the losers in the second tier next season. The bottom two places are between Dundee, St Mirren and Hamilton Academical. The champions will be promoted to the Scottish Premiership. The third and fourth-placed sides will meet in the first round of the play-offs, with the winners playing the division's second-placed team. Whoever emerges victorious from that two-legged encounter will face the second-bottom side in the Scottish Premiership - again both home and away - with a spot in the top flight the prize. Leaders Ross County need a maximum of four points from their last three games to be promoted. Dundee United - the only team who can catch them - are second and have clinched a place in the play-offs, with Ayr United and Inverness Caledonian Thistle close to filling the other places. The bottom club will be relegated to Scottish League One. The ninth-placed team will enter a play-off with three third-tier sides. Teams finishing second, third and fourth will enter a play-off with the ninth-placed team in the second tier. Raith Rovers are assured of their play-off place, with Forfar close to joining them. The bottom club will be relegated to Scottish League Two. The ninth-placed side will enter a play-off with three fourth-tier teams. The champions will be promoted to Scottish League One, while teams finishing second, third and fourth will enter a play-off with the side who finished ninth in the division above. Peterhead, Clyde, Edinburgh City and Annan Athletic are assured of at least a play-off place. Peterhead will clinch the title on Saturday if they win and Clyde lose. The team finishing bottom, either Albion Rovers or Berwick Rangers, will enter a play-off (on 11 and 18 May) - against the winner of a play-off between Lowland League champions East Kilbride and Highland League champions Cove Rangers (who meet on 27 April and 4 May) - for the final place in League Two for the 2019-20 campaign.